Stress is the New Black: The Dynamic Duo Go to Kindertarten and Justin is employed! The Dynamic Duo Go to Kindertarten and Justin is employed! Here is my I Phone picture of our two sweeties on their way to Kindergarten. It went wonderfully well! They enjoyed their first day immensely and if it is any indication of what is to come then I would say that the year will be quite successful! How the heck did our sweet baby girl and boy morph into capable and independent little souls who are venturing into the first year of their academic career? All this on the heels of our son finishing law school and taking the bar. On the same day that the DD entered Kindergarten, Justin accepted his first paid position in a law firm. Could this mother be any prouder? NO WAY! I love being JJ, Starr and Spice's Mom. It is the best job in the world! Congrats to Justin on finding a job!!! It is hard to believe you have two starting Kindergarten and one finishing his academic career. You have many fun years ahead with those two cuties! Oh my goodness! 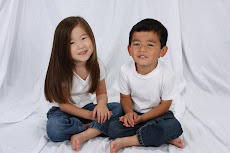 Katie Starr & Ethan couldn't be any cuter! They look so grown up in this pic. I know they're ready for kindergarten, but is kindergarten really ready for the DD? Congrats to Justin on getting his new job!! All I can say is...Congrats to all 3 of your kids!!! What a successful day it was and year it certainly will be for them!!! Congrats to the proud mommy and her family! What a big day for everybody! !